Church Lane Bridge is a minor waterways place minor waterways place place on the waterways major waterways place village town city on the Grand Union Canal (Grand Junction Canal - Main Line - Gayton to Brentford) between Willowbridge Bridge No 99 (14 miles and 3¾ furlongs and 16 locks to the north) and Marsworth Junction (Junction of Grand Union Aylesbury Arm with Main Line) (½ furlongs to the south). The nearest place in the direction of Willowbridge Bridge No 99 is Town Field Farm Bridge No 130; 1½ furlongs away. The nearest place in the direction of Marsworth Junction is Marsworth Services; a few yards away. 90 Vicarage Road, Marsworth, HP23 4LU — 308 yards to the northeast. 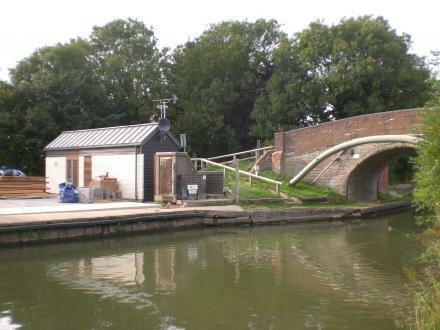 Lock 39 Startops End, Marsworth, HP23 4LJ — 459 yards to the southeast. 1 Vicarage Rd, Marsworth, HP23 4LR — 531 yards to the east. Wilstone Village Hall, Tring Road, Tring, HP23 — 1604 yards to the west. 67 Tring Road Wilstone, Tring, HP23 4PE — 1486 yards to the west. 37 Lower Icknield Way, Tring, HP23 4LN — 513 yards to the southeast. Lukes Lea, Marsworth, HP23 4NH — 623 yards to the south. Startops End, Marsworth, Tring, HP23 4LJ — 448 yards to the south. Wistone Green, Wilstone, Tring, HP23 4NT — 1493 yards to the southwest. Tringford, Tring, HP234 — 949 yards to the south. Tringford Piggeries, Tring, HP23 4LH — 973 yards to the south. Tringford Piggeries, Tringford Road, Tring, HP23 4LH — 892 yards to the south. Long Marston road, Marsworth, HP23 4NB — 536 yards to the northwest. Tring — 571 yards to the east. Marsworth, Tring, HP23 — 287 yards to the northeast. Marsworth — 287 yards to the northeast. Gubblecote — 1406 yards to the west. Vicarage Road, Marsworth, HP23 4LU — 322 yards to the east. 1356 yards to the southeast. Wendover — 1385 yards to the southeast. Wilstone Village Hall, Tring, HP23 4PE — 1555 yards to the west. Unit 15, Marsworth Airfield, Marsworth, HP234NF — 65 yards to the southwest. Tring — 1418 yards to the southwest. Church Lane, Tring, HP23 6LU — 226 yards to the east. 60 Tring Road, Tring, HP234 — 1553 yards to the west. Tring — 322 yards to the east. Wilstone Village Hall, Tring, HP234PE — 1555 yards to the west. Tring, HP234LS — 465 yards to the east. Marsworth Millenium Hall, Marsworth, HP23 4LR — 538 yards to the east. 63 Lower Icknield Way, Tring, HP23 4LW — 628 yards to the east. Grand Union Canal, Kings Langley — 1159 yards to the northeast. 1521 yards to the west. 84 Tring Road, Hertford, HP23 4PD — 1516 yards to the west. Vicarage Road, Marsworth, HP23 — 322 yards to the east. Tring — 1041 yards to the south. Milton Keynes — 127 yards to the east. 127 yards to the east.